Shopping for Acid Rain Action Figures? Enter the gritty world of Acid Rain. Awesome mecha action figure transforms from tank to armor mode! Features a light-up monitor in the cockpit and a removable cannonball! Will house a 3 3/4-inch action figure (sold separately). The gritty world of Acid Rain brings you this amazing mecha. The Acid Rain Sand Stronghold Transforming Mecha Action Vehicle is what action figure and toy fans have been waiting for. Able to house a 3 3/4-inch action figure (sold separately) in its cockpit, this awesome mecha action figure also transforms! Drive your marine action figure to battle in style when in tank mode, or do some real damage by putting it into armor mode. With a light-up monitor in the cockpit, this fantastic mecha figure even includes a removable cannonball! In armor mode, the Stronghold measures approximately 10 1/4-inches tall x 10-inches wide x 6 3/4-inches long. 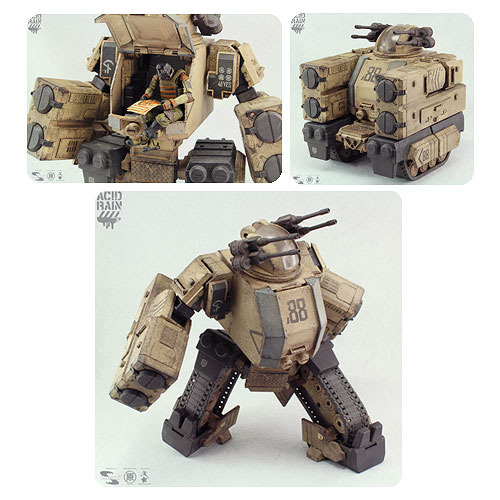 In tank mode, it measures about 6 3/4-inches tall x 6-inches wide x 6-inches long. Ages 16 and up.